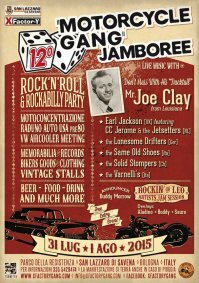 LA 12° EDIZIONE DEL MOTORCYCLE GANG JAMBOREE OFFRIRA' A ROCKERS, RODDERS, BIKERS E A VOI TUTTI UNA DUE GIORNI DI ROCK’N’ROLL & ROCKABILLY CON UNA PROGRAMMAZIONE ASSOLUTAMENTE IMPERDIBILE! ANCHE QUEST'ANNO UNA GUEST STAR D'ECCEZIONE: UN ALTRO MITO DELLA MUSICA AMERICANA DEGLI ANNI ‘50, DALLA LOUISIANA, "MR DUCKTAIL" JOE CLAY. VINTAGE, GASTRONOMIA, FIUMI DI BIRRA E MOLTO ALTRO! THE MOTORCYCLE GANG JAMBOREE 12th EDITION WILL PRESENT TO ROCKERS, RODDERS, BIKERS AND YOU ALL A ROCK'N'ROLL & ROCKABILLY WEEKENDER WITH AN AMAZING BILL YOU CAN'T MISS IT! 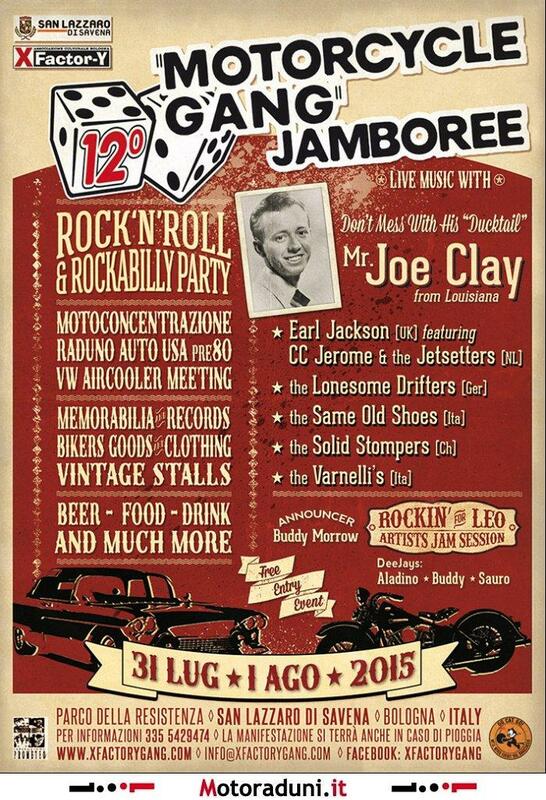 THIS YEAR A GREAT GUEST STAR: ANOTHER ICON OF THE 50's AMERICAN MUSIC, FROM LOUISIANA, "MR DUCKTAIL" JOE CLAY. MOTORCYCLES, AMERICAN CAR AND BUGS PRE '80, BIKER AND VINTAGE STALLS, FOOD, LOT OF BEER AND MUCH MORE! ROCKIN' FOR LEO Musician tribute to our "Ragazzaccio"
PER OTTENERE LA CONVENZIONE,AVVISARE DI PARTECIPARE AL FESTIVAL. TO GET FESTIVAL SPECIAL PRICE PLEASE ADVISE AT THE TIME OF BOOKING.